The Australian Tax Office (ATO) are cracking down on trust structure, and may result in these trusts paying double the tax they are paying now. What they are targeting are the stapled securities, used for a long time for commercial property deals. This has allowed the foreign investors to pay a discounted tax rate of 15% rather than the full tax rate of 30%. ATO is not very happy, particularly in the last few years where they see a heighten amount of these structures being created to minimize the tax they paid. The common tax structures – which comprise a trust which leases land and assets to a related company – have been promoted by successive governments to encourage investment in passive income activities such as shares, property and land. The key party here are investors, particularly non-resident investors like you and me. Instead of being tax at a corporate tax rate of 30%, the dividends declared are unfranked, instead you are taxed at your marginal tax rate level rather than corporate tax rate. 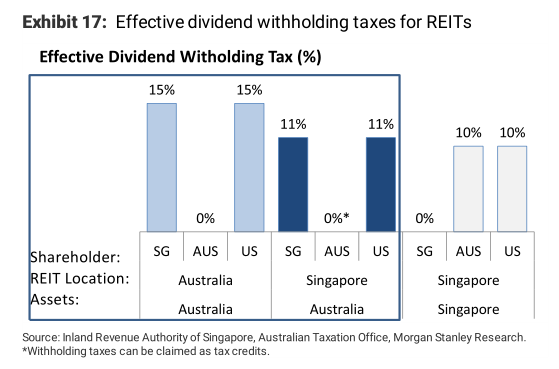 As non-resident investors, according to the double taxation agreement between Singapore and Australia, the gross income from the properties under these REITs will be taxed 15%. This is much lower than 30% tax at corporate level and the company declaring the dividend fully franked. If you see the dividend as fully franked, as an investor in Singapore, there should not be dividend withholding tax. Australian investors can claim back tax credits. This is coherent with the work of Morgan Stanley research for Frasers Logistics and Industrial Trust, which have all its assets in Australia. If you are a share holder in Singapore, the REIT is domiciled in Australia, the assets in Australia, your tax is 15%. If your REIT is domiciled in Singapore, it turns out its lower. What ATO is not happy about, are likely the operating companies that tries to take advantage to declare most of the income that is operating in the stapled securities as assets. This way they reduce the tax being paid. If its a 50-50 split between assets and operating, the tax paid for the non resident investor should be the average of 15% and 30%. The crack down particularly looks to be targeted at foreign investors like Li Kar Shing, who is trying to buy DUET and have much investments in Australia in this area. Li probably finds these developed infrastructure as a good strategic shift away from China and Hong Kong. Advisers are particularly irate the government appears to be seeking to “have their cake and eat it” with the ATO alert flagging the crackdown may not apply to governments that have reaped the benefit from multibillion-dollar asset sales such as Ausgrid, Port of Newcastle, Port Botany and Kempla and Port of Melbourne. SKI: withdrew the ATO’s challenge of Spark Infrastructure’s tax structure. AST: the ATO has settled its review of Ausnets tax structure and AST has since collapsed its stapled trust structure and is now a full tax paying entity. As investors, we should always be aware that regulation risks are present and things will remain unchanged always. This review does not seem to point to the property sector, but we can see a time where the government have to shore up its coffers, when other avenues to gain revenue is exhausted. REITs that are listed on SGX own properties around the world, and while we enjoy the pass through of taxes on the REIT level, the REITs do pay their fair share of taxes underlying. 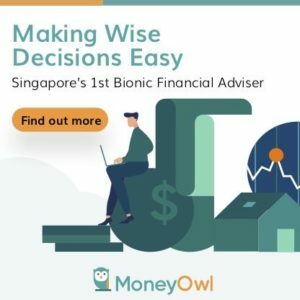 The conclusion of such risk is not that you should invest within Singapore. In fact, the government of Singapore could change the tax regulations if they want. In March 2015, all eyes for investors was on the Singapore Budget, where the government extended income tax and GST concessions to the REITs for another 5 years. This means that investors do not have to give up 10% of their dividends to the tax authorities if the income tax breaks expire. In addition, REITs do not have to pay GST or income tax from their foreign holdings and this will enhance their profitability for the next five years. However as the stamp duty exemption goes, they will have to pay more for their property acquisition. Without this stamp duty advantage, we see coincidentally a shift by some REITs to purchasing overseas properties. Imagine paying 10% income tax on the Singapore properties and 15% withholding tax on Australian properties in a Singapore domiciled REIT. If this reduces the appeal of REITs as an investment vehicle, then its time to shift to another. It would depend on whether the governments want to tarnish their REIT ecosystem they have built up. I think Australia Taxation Office is going after tax matters relating to the use of stapled securities and infrastructure / energy investments. 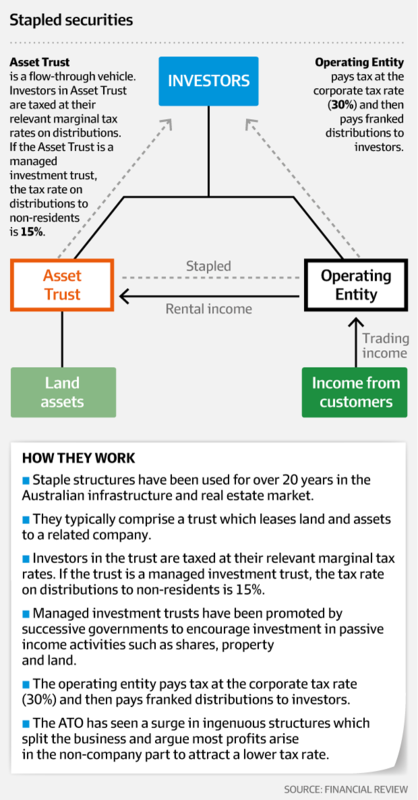 Australia has well developed REITs regimes which FLT operates under, with REIT structures offering tax efficiency.